About 280 letters written by Cartier to Jean-Francois de Paule-Louis de La Saussaye, with whom he cofounded Revue Numismatique. Étienne Jean Baptiste Cartier (1870-1859) specialized in medieval and modern, particularly French, coins. Étienne Jean Baptiste Cartier papers, 1830-1851, Archives, American Numismatic Society. 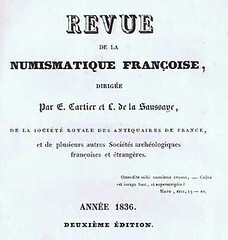 Étienne Jean Baptiste Cartier (1870-1859) co-founded the journal Revue Numismatique (Numismatic Review) in France with Jean-Francois de Paule-Louis de La Saussaye in 1836. The two served as coeditors from 1836 until 1856 when they sold it. In the early 1800s, Cartier held a position in the currency exchange at the Paris Mint, but was forced out during the 1830 Revolution and withdrew to Amboise. Cartier specialized in medieval and modern, particularly French, coins. Contains About 280 letters in French written by Cartier to his friend and co-founder of the journal Revue Numismatique (Numismatic Review), Jean-Francois de Paule-Louis de La Saussaye. The first letter in the collection was written by Cartier in Paris (1830) and the rest were sent from Amboise. The beginning of their friendship, originally based on the exchange of coins and information about them, is reflected in the correspondence, but as their association developed other matters, such as business worries and resentments over the younger de La Saussaye’s attainment of honors of which Cartier felt he was being deprived, are discussed. By 1845, Cartier began to express concerns for the fate of the Revue because he felt that de La Saussaye’s overburdened schedule did not permit him to devote enough time to it. By the 1850s he began to state his desire to withdraw from the Revue, and letters from 1855 to 1856 concern the selling of the journal. Another point of contention between the two friends was the reluctance of Cartier to give space in the Revue to antique coins and Cartier’s feeling that his partner gave too much space to Paris intellectuals at the expense of provincial subscribers.